I oppose the government position not just on this matter. My entire life I have worked against the occupation and for the vision of two countries for two peoples.It is a legitimate struggle, even if will remain the last citizen of Israel I will continue to support that step which is a moral implementation of the Palestinian nation in order to free themselves from the Israeli occupation. Last year as well the PA turned to the UN, and it was punished by the international community - but the Palestinian nation survived. This time the decision is to not prioritize considerations of financial international support over the struggle for independence and for stabilizing the position of Palestine as an independent country. This is a news clip about the Weberman trial. You can post some words of support for the victim on Rabbi Horowitz's website. He has been at the trial and he says the victim appreciates all the words of support and they help her be strong in her recovery and in her ability to stand up to what was done. After graduating from Yeshiva University, four of the original Maccabeats have now formed a new a capella group called Stand Four..
Rav Nissim Karelitz was recently asked a halachic question regarding a family that had asked the Lev Malka organization, an organization that assists children with cancer, to come say shema by the deathbed of their child. The question was raised because the family has decided to disconnect the child from his machines because they no longer can bear to see him suffer. The doctors have not said, according to the report, that the boys situation is so critical that his days are or hours are numbered. The question asked, threfore, was can, or should, they say shema and the vidui for this child, as doing so might be considered assisting in causing his death? Rav Nissim Karelitz paskened that it is prohibited to say shema by the deathbed of a child who's family want to disconnect his machines, as doing so will shorten his life that was designated for him by heaven. I find this psak fascinating, and surprising. The child is going to die anyway, as the family is cutting his machines. I would have thought that we would not want to deny the child his deathbed shema and vidui, considering the situation isnt of our choosing anyway. It is determined that the shema will hasten the child's death, and therefore it cannot be said. It makes sense to me, but it is surprising. A question I do have based on the way it was reported, is that supposedly Rav Karelitz said that saying the shema would shorten the lifespan of the child as it had been determined by heaven - that makes me wonder: if heaven gave a specific lifespan to the child, won't he (or she) live that out regardless of the machines he is or is not attached to? Maybe this is the correct amount of time that had been determined. Is it even possible to shorten a life if it was determined Above? Do we have control over such things? I never would have thought so, but that does seem to be what Rav Karelitz is saying. And if this is true, do we also have the ability to circumvent our heavenly decreed fates on other issues, like parnassa, rain or anything else that is determined above? Obviously teshuva and doing good deeds can be a factor that might cause such changes, as becoming evil and doing bad deeds might change it the other way, but I would view that as a way of changing the decree, not circumventing it. According to the statement quoted of Rav Karelitz, there is also a way to circumvent heavenly decrees. Tzippi Livni's new party is polling currently at about 7 seats, so if Rav Amnon Yitzchak is right even he might soon have more political power than her. After a few weeks of consideration and rumors, Rav Amnon Yitzchak has finally announced the formation of his new political party, The Power To Influence. According to Kikar, Rav Yitzchak said that after being asked repeatedly by his students and fans why he doesnt go to elections for the government and even to become prime minister, he decided to announce that he is doing so. He predicts double-digits of number of seats he will win, but he says that before he has even done any work the polls are already showing him with a minimum of at least 5 or 6 seats. While he has not announced his party's platform on various issues yet, it seems he is not going to ignore the security issues like many of the small or new parties do when trying to focus on a niche sector, but he immediately spoke about his thoughts on the peace process. He says we need to speak straightforward with the enemy, and not let Obama decide for us and pressure us into doing things. A leader must serve the needs and desires of his people and not listen to world leaders who say things based on their own interests. Had he not discussed this, I would have assumed his platform would consist of banning iphones and musicians.. It seems that in the Satmar community they are fond of Rav Yitzchak and a significant amount of money is donated to him from Satmar because of that fondness. The question is why they find him so appealing. While some say it is because of his great work in bring people back to Judaism, others say it is because in his speeches he commonly denigrates the Zionists and secular politicians, making them into a joke, and that serves the interests of Satmar. I don't know what voters Koach L'Hashpia will target. Will he target haredim, attempting to pull frm Shas and maybe UTJ? Will he go to the crowds that go to his speeches - the young people from traditional backgrounds who are not religious? Wow. This woman was heroic. A knife-wielding intruder broke into a woman’s home early Monday morning in a community in the Eshkol border region and was fought off by a tenacious mother protecting her four children. Later in the day, the mother, Yael — who was only identified by her first name and who was lightly injured in the attack — had her version of the story related to Ynet by her father. The intruder, a Palestinian man who apparently infiltrated Israel from the southern Gaza Strip, broke into Yael’s home in Sde Avraham at 4 a.m., armed with a crowbar and a knife. Upon entering the master bedroom where Yael and her 2- and 4-year-old children slept, the man reportedly attempted to attack the woman. But Yael confronted her assailant, and during the ensuing life-and-death struggle she was stabbed in the face and shoulder. She nonetheless succeeded in repelling the attacker, and ushered her children into the house’s safe room. The armed man threw various household objects at Yael, including a mirror which shattered. She was able, however, to shove the attacker into the adjacent bathroom and bar the door with the bed. “While the attacker was in the bathroom, she managed to call her neighbor, who was [on the community's] security detail, and her husband, who serves [in the IDF],” Yael’s father told Ynet. The intruder climbed out of the bathroom window and fled the scene. “He realized that he couldn’t overpower her and that she’s strong and determined,” he said. IDF troops and police who arrived moments later chased the man to a nearby greenhouse and attempted to detain him. When the suspect failed to halt when ordered, he was shot and killed. Troops combing the area, in the Shalom bloc of the Eshkol region, also found a hole in the border fence with Gaza which was apparently connected to the incident. The IDF later stated that the Palestinian man cut through the Israeli border fence undetected, and said it was investigating why the electronic fence and IDF surveillance did not notice his entry to Israel. The man had no identifying papers on his body. I have not seen any news on this issue in a while. When Egged made the decision to no longer allow human faces of either gender to be included in advertising placards on the buses, in response to petitions claiming discrimination due to male pictures being allowed and female faces not allowed, it seemed like they had found a solution that worked. The State is now responding saying they are opposed to Egged's decision. According to Haaretz's report, the State responded to the Supreme Court saying that it is clear Egged's decision was just a way to get around advertising with faces of women. This is a breach in the license agreement between Egged and the State. The Supreme Court took the response to the petitioners, the Yerushalmim Movement, and asked i they are now satisfied and will pull the petition or if they wish to continue pursuing the matter. The group responded saying that the State has said they dont accept Egged's solution, but now they want to see what the State is actually going to do about it - will the State pull Egged's license or put some sort of sanctions to force Egged to comply? Until Egged agrees to advertise with faces of women, the petition continues. Egged's spokesperson responded to the news with a patronizing statement, saying that with Israel is busy with a war (note; this happened during the Amud Anan operation in Gaza), and hundreds of Egged drivers have been drafted, I will not deal with this now but will leave our response for the arena of the courts. It's a cynical approach, especially since it is not likely any decision will be made and enforced in time to be used during the current election cycle, but the timing is right. There is a little party called Meretz. All of Meretz's voters are in the media, and they judge all the other parties according to the platform of Meretz. The IDF released this video from the test of the new defense system "David's Sling". David's Sling is a larger version of the Iron Dome system..
9. are party primaries democracy at work or a big joke? I have never been able to figure out MK Moshe Gafni (UTJ). Sometimes he says things that make a lot of sense, and then other times he contradicts himself. When he says things that I don't necessarily agree with, or like, that is fine and it does not bother me because he is representing a very specific ideology. What gets me is when he tries to present himself to the public as being some sort of moderate, somebody to work with, but then internally he basically admits it was all a lie just to dupe the general public. That's the only way I can understand his latest self-contradiction. Seems reasonable. Even surprising to many, as here is a haredi politician saying yeshiva students not studying seriously in yeshiva should go to the army. I have heard Gafni say that before, though I have yet to see him lead a movement in the yeshiva system of weeding out the boys who are not learning and sending them to the army. Today, however, MK Moshe Gafni is singing a different tune about the army. The Yated Neeman has been making claims that the Lishkat HaGiyus, the IDF Draft Board, has been harassing yeshiva students; demeaning medical exams (not sure what that means - doesnt everyone go through the same medical exams? ), attempts to get them to sign papers, attempts to persuade them to actually join and forgo the deferral, etc..
One is an external presentation - when he talks to the general public he says things to appear as a reasonable, moderate person, representing a reasonable position, while when dealing internally, he takes a very hard line against the army. As I said above - if Gafni would say to the public what he says internally, or vice versa, that would be fine with me. He represents a certain ideology, and that is what he is trying to sell, and explain. What irks me about him is the way he sells to the public one bowl of lokshen, as the Israeli phrase goes, and a different one internally. What does he really believe, who is he really playing? Does he really believe in his more moderate statements, or does he really believe in his more militant statements? Is he pulling a fast one on the general public, or is he pulling a fast one on the haredi community? That I would love to know. According to the Central Statistics Office, 26.951 students dropped out of school in 2011, and 4694 of them were dropouts from primary school. Most of the dropping out happens when entering, and during, high school. And this is where the high percentage of haredi dropouts is recorded: 5.3% overall dropout, while 17% of haredi students dropout between 11th and 12th grade. There are some more interesting statistics as well - Arabs have a 77% higher dropout rate than do Jews, and among new olim the dropout rate is 3 times higher than it is among the general population. I know the office of statistics is responsible for gathering statistics, but I would like to see some analysis and studies to determine why these students are dropping out. Such a report should be complimented with a report from the social services and/or from the Ministry of Education analyzing what the common causes are among the different sectors that might affect the dropout level. My only comment on the statistics presented are regarding the Haredi dropouts from high school. 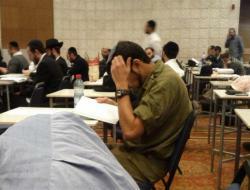 17% of Haredi students dropout between the 11th and 12th grades. There are not too many haredi high schools that have 4 years of schooling - the 9th through 12th grades. Most haredi schools, that I am aware of, are in the yeshiva ketana system, which is a 3 year system. After 3 years of yeshiva ketana, the students generally continue on to yeshiva gedola. While there are some high schools in hared communities that operate on the 4 year system, there are no more than a handful of them - not nearly enough to be the source of any serious statistics on the matter. So, with no 12th grade in the haredi school system, I am not sure how 17% of haredi students are dropping out of school between the 11th and 12th grades. Perhaps there are haredi children in the general school system and that is the source of the numbers of haredi dropouts, but it does not seem accurate to describe haredi dropouts if they are dropping out of a non-haredi system - they should just be considered general dropouts like the main statistics. The liberal Likud has died. Even Menachem Begin would not find his place in this dubious team. It is scary to think what will happen here if the power remains in the hands of the Likud. It seems a bit redundant now to add Lieberman to this list which is so nationalistic. While I don't agree with Zahava Galon, nor with the frightened headlines all screaming how the Likud has made a sharp right turn, I happen to believe that Galon is one of the few people in Israeli politics who have the right to make such criticism. The other two people with the same privilege, in my book, are Shelly Yachimovitch of Labor and Naftali Bennet of Bayit Yehudi. The reason why these 3 party heads have the right to comment is because they too, like the Likud, hold democratic primaries by which the party candidates are chosen. Other party heads who are lobbying their criticism of the Likud primary results, party heads such as Yair Lapid specifically, do't really have a right to comment. Yesh Atid is a party formed non-democratically. All its positions on various issues were decided by one person, the party list was and is being determined by one person, and everything else about the party is being determined by one person. All the parties that operate in a dictatorial style have no right to comment with criticism on the results of a democratic process. Chadash weekly related a fascinating story that demonstrates the power of Torah study to defend against missle attacks. The newspaper explains that the constant sirens that overtook Ashdod during last week’s fighting not only endangered the students at a certain yeshiva, but also disturbed their learning. Accordingly, the yeshiva moved to a beit midrash in Nachalah u'Menucha here in Beit Shemesh. Many local institutions and yeshivot helped with the logistics, including preparing meals and doing the students’ laundry. The story continues, "One of the important talmidei chachamim from the Kiryah HaChareidit told us, 'There is no doubt that the volunteerism of the population of Beit Shemesh so that the sound of Torah study not stop... is the Iron Dome of the city; it was the true shield upon us, and that which is the reason that the residents of the city (i.e., Beit Shemesh) are not part of the cycle of bloodshed.'" I find this attitude very troubling. I agree that Torah learning is a means of guarding the city (albeit an indirect one, in a time which is not yet the geulah shleima). Yet if the volunteerism for the sake of Torah is the real reason that Beit Shemesh was not targeted, wouldn't it have made more sense for the yeshiva to have stayed in the South, which was obviously more in the line of fire than Beit Shemesh? Indeed, couldn't we argue that by welcoming the yeshiva to Beit Shemesh, the residents who accept that Torah is guarding them rather than Tzahal were being extraordinarily selfish? Wouldn't the natural extension of their philosophy be that instead of helping the yeshiva relocate, people should have encouraged them to stay and learn in Ashdod - on the front lines - where they could do the most good? In fact, shouldn't all yeshivot that abide by the philosophy that Torah guards the city (and accordingly assert their right to stay out of the IDF because their learners are doing more for Israel by learning than by fighting) have relocated to the South, rather than encouraging the yeshivot in the South to relocate to Beit Shemesh? Again, I don't deny that Torah guards the city. But the hypocrisy in situations like that mentioned in Chadash is astounding, and demands a response. This stands in stark contrast to the Hesder yeshiva in Sderot, headed by Rabbi Duv Fendel, which temporarily relocated its Kiryat Gat branch to Sderot, and instituted shifts so that Torah was learned in the Beit Midrash for 24 hours a day. This yeshiva, the students of which serve in the IDF, supported the war effort both physically and spiritually. If the Chareidi population claims that their learning is in lieu of actively fighting, and that their only contribution to the war effort is their learning (unlike the Hesder yeshivot, which both learn and send soldiers to the front), I would expect that they would be even more stringent about relocating to the most endangered areas. I would, accordingly, like to make a suggestion to resolve the ongoing impasse regarding Chareidi service in the IDF. Perhaps the most obvious solution is to take the Chareidi public at its word: that its yeshiva and kollel students are the equivalent of IDF soldiers, and are doing their part to protect the State of Israel. I know full well that this will never be accepted. Secular Jews would complain that it is not fair to allow such a large population to learn rather than fight in the army. That said, my real question is whether or not the Chareidi leadership and public would accept such an arrangement – and if not, why? The cellphone companies have mostly calmed down with their offers and have arrived at some sort of fairly stable pricing. 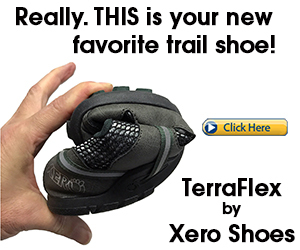 Besides for the occasional special price, it has been more or less stable the past few months. But, yes, today Pelephone called me up and asked me which mobile service I am using. They then asked me if I am satisfied, and after responding that i am, they asked if they could make me an offer to get me to consider switching to them. I responded positively. Sure enough, they made an offer that was more expensive than the plan I am currently on. They knew the price I am paying because they asked me what service I use, and they still made me a more expensive offer. Were they really expectng me to say yes? If I had said I was not satisfied with my current provider, I'd be able to understand - maybe I'd be willing to pay a little more to get better service. If the price offered was cheaper, I'd also understand - something to reel me in. But they knew I am satisfied, and they knew they are offering me a higher price. So, what exactly were they expecting? UPDATE: This screening is taking place THIS Tuesday night!! The dramatic and compelling movie follows the events which resulted from a series of allegations of child abuse received by Phil Jacobs, a journalist at the Baltimore Jewish Times. 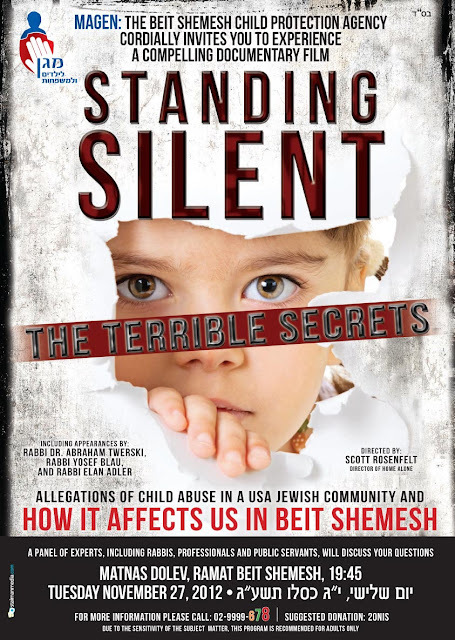 The prize winning movie is directed by Scott Rosenfelt, director of the children's blockbuster "Home Alone"
This Magen event is to raise awareness of child protection and abuse risks in the Bet Shemesh/RBS communities. Following the movie, a panel of experts will address questions from the audience and discuss the many disturbing and important issues raised by the movie. "Our enemies fight with rockets, but today, you, the students of Machon Maayan, have demonstrated that the Jewish people fight with unity and acts of kindness," said Binyamin, a resident of Be’er Sheva. On Tuesday, November 22, the students of Machon Maayan, a one year study program in Israel for young woman focused on personal growth, Torah learning, leadership training, and connecting with the People and State of Israel, organized and ran a “Yom Kef” - a “Day of Fun”, for the children of Be’er Sheva at Davida's farm in Moshav Yishi just outside of Bet Shemesh. Two buses of children arrived, in addition to parents and even some grandparents. For the past few weeks, and particularly for the last 8 days during Operation Pillar of Defense, the citizens of Be'er Sheva have experienced a constant barrage of rockets. The children, who have been cooped up in small bomb shelters, were able to enjoy a day free of sirens and the accompanying terror of running to a safe room at a seconds notice. When the children arrived at the farm, the Machon Maayan students greeted them with clapping and singing. Each child received a yellow shirt designed by two students with an emblem that read “Machon Maayan im Toshvei Hadarom” – “Machon Maayan is with the Residents of the South”. “When they first walked in they were nervous, but once they started doing some of the activities, they got the biggest smiles on their faces. It really impacted me and gave me so much pleasure knowing that I was providing that happiness for them,” said Orli Friedman, a Machon Maayan student from Chicago, Illinois. Orli ran an arts and crafts booth where the children were able to paint wooden dreidels and make bracelets with beads and pipe cleaners. Arts and crafts, music, pony rides, two jumping castles, swings, a short hike, a petting zoo, and a bonfire were just a few of the fun things going on at Davida’s farm. The children enjoyed the cotton candy machine, popcorn, homemade cookies, s’mores, and an Israeli Chanuka favorite – sufganiot (jelly donuts). The event was sponsored by parents of Machon Maayan students and alumni who donated generously to the cause. On the farm there were goats, chickens, turkeys, an ostrich, peacocks, horses, turtles, guinea pigs, rabbits, a camel, and a donkey. The Be’er Sheva children were able to brush and ride horses and the petting zoo was open for children to hold rabbits and guinea pigs. Davida, who generously offered her farm for the “Yom Kef”, commented, “Playing with animals can be very therapeutic for children who have gone through trauma like the children of Be'er Sheva”. Parents were able to relax while students took their children around the farm to the various booths. The student organizers felt that it was important for the parents to finally have some time to sit quietly knowing that their children were being looked after, and were happy. At the end of the day, dancing broke out and all of the participants sang "Am Yisroel Chai" - "The Nation of Israel Lives." There were smiles on the faces of both the children and the Machon Maayan students. The children were given goody bags with homemade cookies and dreidels before they left. Alana Fischer, a Machon Maayan student from Orlando, Florida said, “It’s an incredible feeling to know that you have played an active role in Operation Pillar of Defense. We might not be on the front-lines but we tried our hardest to bring at least 5 hours of relief and happiness to children who should never have to suffer like this again”. Q: In your encyclopedic work, A Lethal Obsession. Anti-Semitism from Antiquity to the Global Jihad (Random House, 2010), you present Islamist antisemitism as an existential danger to modern civilization. Could you explain? A: In my view, Islamic antisemitism is by far the most dynamic and threatening form of antisemitism existing at present in the contemporary world. It combines the scourge of Islamist terrorism, the spread of jihad, hatred of the West, Holocaust denial, and the genocidal “anti-Zionism” which is state-sanctioned in Iran. The dramatic triumph of the Muslim Brotherhood in Egypt and the alarming growth of militant Salafist movements across the Arab Middle East have greatly increased the level of threat worldwide. Q: Is there a historic connection between European fascism and Islamism? A: The Muslim Brotherhood, founded in Egypt in 1928 by Hassan al-Banna, had a radical totalitarian vision of societal transformation, a leadership cult, and visceral hatred of Jews not so different from that of fascism and National Socialism. Moreover, the charismatic founder of the Palestinian Arab national movement, Haj Amin el-Husseini, was a fanatical genocidal anti-Semite who actively collaborated with Adolf Hitler during World War II. This “annihilationist” tradition of Jew-hatred has continued in the Palestinian Hamas movement (an offshoot of the Muslim Brotherhood) to this very day. Its Sacred Covenant is one of the most nakedly anti-Jewish texts of the entire post-Holocaust era. Q: You have described the impact of the Nazi legacy on radical Islam, but what about classical right-wing antisemitism in present-day Europe? A: Populist right-wing tendencies are especially strong in Hungary, Austria, the Netherlands, Belgium, parts of Scandinavia, and the Baltic States, in Eastern Europe, and even here in like Switzerland. Nor are France, Germany, or Italy immune. Against the background of an alarming world economic crisis, the possible collapse of the Euro-zone, the specter of globalization, and a massive migration from the poorer southern countries to Europe, these negative trends will probably grow. Antisemitism is part of this wider syndrome. Q: In your newest book, From Ambivalence to Betrayal. The Left, the Jews, and Israel (University of Nebraska Press, 2012), you are often severely critical of Western leftist attitudes to Israel and the so-called “Jewish Question.” How do you explain left-wing hostility? A: The Left is suffering from acute amnesia. It has forgotten, for example, that Egyptian president Nasser and his Arab allies openly threatened to throw the Jews into the sea in 1967. To this day, Hamas, the Hezbollah and their Iranian backers, not to mention other Arab states, constantly broadcast their intention to eradicate the Zionist “cancer” from the Middle East map. So I ask people on the Left — is that a “progressive” position? Hardly. The Left has also forgotten that there was an uninterrupted Jewish presence in the Holy Land long before the birth of Islam — and despite endless harassment, along with Roman, Byzantine, Crusader, and Muslim persecutions and massacres, this Jewish settlement continued until the emergence of the modern Zionist movement. Q: Why do you think so many leftists are pro-Islamist today? A: The Western Left and the Islamists both share the myth that Israel is a “white,” Western, and colonial intrusion in the Middle East. They both have embraced a radically distorted view of Palestinians as defenseless “Jews,” downtrodden, and ruthlessly abused by fascist Israelis. Behind this demonic imagery there is an antisemitic view of Israel and America as twin embodiments of capitalist-imperialist evil. Needless to say, this mythology is totally disconnected from empirical reality. Q: In light of your current trends, do you see any future for European Jewry? If you were living here, would you stay or go? A: I personally believe that the long-term future of European Jewry is bleak. I would not wish to decide for European Jews what future they should choose, but I am convinced that the land of Israel is the only possible spiritual and political homeland for the Jewish people. Let us also remember that it was in the city of Basel that Theodor Herzl first proclaimed to the wider Jewish and Gentile world in 1897 the birth of modern Zionism. In his diary he prophesied that within fifty years a Jewish State would inevitably arise. Many people at the time dismissed him as a charlatan or a dreamer. But his prophecy came true and for that we should be thankful. Egged has had the policy for a long time of letting passengers on to the first bus after Shabbos, from the Kotel, despite not having money to pay. Egged knows that many people walk to the Kotel on Shabbos, and obviously they are not carrying any money. The only way for them to get home would be to either walk, or via Egged - but they don't have money to pay for the ticket. So, Egged has been good about that and let's people get on the first bus after Shabbos, despite not having money. It was never considered, by Egged, to be an ideal situation. Egged can't really know if people do or do not eventually pay for those rides, but giving free rides to lots of people is not really included in their business model. According to Mynet, a number of Shabbos parsha papers have recently been discussing the topic of whether one can carry the new rav kav, the smart card, cards on Shabbos or if they are muktzeh like money. I don't know why they would be any different than the old-fashioned kartisiyot, the bus tickets that would get punched with holes for rides, but it seems a number of poskim say that one is allowed to carry these rav kavs on Shabbos. Rav Baruch Efrati says it is allowed. This would give Egged the ability to say that they no longer offer "free" rides, and that people should carry their rav kavs with them if they plan to take the bus home after Shabbos. Interestingly, on a related topic, there has been a problem, commonly enough with CityPass, the operators of the Jerusalem Light-Rail. Many times the machines to buy tickets are not working at any given station. Either they don't work at all, or they don't give change and demand exact change for payment, and sometimes the credit card reader isnt working. Some people take the risk and get on the train anyway, and plan to pay later for the ride. After all, it is not their fault, but they need to use the public transportation. The article quotes a rav who is against riding the train in such a situation. Rav Erez Malca says that if the cash register in a store was not working, you would not just take your stuff and leave. Therefore, he says, getting on the train in this situation is also stealing. If CityPass would allow it, that would be fine, but City Pass explicitly says that boarding the train is not allowed under these circumstances, and therefore doing so would be theft. I have not looked into the halacha, and I therefore offer no opinion on whether it should be considered muktzeh or not. I do wish to comment on Egged's expectations from this. According to the article's introduction, this psak is meant to satisfy the haredi community - specifically them, but also all religious people, because it seems they are the bulk of the passengers who use Egged in this fashion after Shabbos. My comment on this is that Rav Baruch Efrati might be a great man and a great posek, but he is not one followed by the haredi community. I would even be willing to bet that most people in the haredi community have not heard of him. With all due respect to Rav Efrati, if Egged is expecting the haredi community to start carrying their rav kavs on Shabbos, they should have also gone to haredi poskim, and probably even the gedolim (because this is a question of chilul Shabbos), to make such a determination. The cease-fire, good or bad, is here. Personally, I don't think it is so bad. I do not think it should have been done, at this point, but now that it has been done I don't think it is so bad. I am not optimistic that it will last for a significant amount of time, based on history, but it is worth giving it a chance to work out. Gaza is not a playground. Last time we went into Gaza to deal with this, under Olmert at the time, a lot of lives were lost and nothing significant was really accomplished. There is no guarantee this time would be any different. It is definitely worth giving the accomplishments we have already achieved a chance to work and deter Hamas from restarting the rocket fire. Hamas won't be so quick to start active hostilities again, considering they know how serious of a response Israel can come back with. I am not quite sure what the big celebration is over. At best, they have committed to stop shooting rockets into Israel, and we have committed to stop shooting at them. That means, considering this as though they brought Israel to its knees means their entire goal in shooting rockets was to get the situation back to the way it was the day before they shot this round of rockets (and the anti-tank missile), 9 days ago. They have declared a holiday over the fact that they successfully turned the clock back 9 days but this time they know they can't start shooting rockets, unlike 9 days ago, or thy will risk the same, or a greater, response from Israel. Khaled Meshaal said about the cease-fire that Israel failed in its effort to create a sense of deterrence. I don't know how he knows that, considering he agreed to stop shooting rockets. If he was not deterred, he would not have agreed to this. The future will show how deterred they were or were not - depending on how quickly they will start shooting again. The only way they can say deterrence failed is by shooting rockets again right away. And then this will be anything but a cease-fire. he starts off seeming a bit smug, and then his talking points, with some mixed semi-British accent, are nothing really new, but at the end he says something interesting when talking about the weak and the strong and who is just and who is wrong.. This is dangerous, and probably criminal. The people who put the sign on this door definitely have qualified for the status of "Chassid Shoteh". The image is of the door to a public bomb shelter in Ashdod. Ashdod, as we all know, is very close to the Gaza border and has been hit badly by Kassam rockets. Bomb shelters in Ashdod are necessary, and their accessibility must be assured. The sign on the door says, "Under the direction of the rabbonim, shlit"a, this bomb shelter is designated for men and bachurim (male students) alone". Meaning, women who find themselves in the area when a Code Red siren blares, can't go into that bomb shelter but will have to spend their 45-60 seconds or so running a couple blocks over to the next bomb shelter. The stupidity of those responsible for this sign is in direct contrast to the hassidim from a couple of days ago who made the effort to help save a woman who needed assistance when the siren went off. Those are chassidim, while these are chassidei shoteh. Our hand is outstretched in peace to those of our neighbors who want to make peace with us, and the other hand is firmly grasping the sword of David against those who wish to uproot us from this country. With the rockets advanced well past the southern areas of Israel, many of us are in a bind. We never really paid attention to the instructions as to what should be done when the siren goes off, as it was not relevant to us. Suddenly, sirens are going off near us (not in Bet Shemesh yet, thank God, but Jerusalem, Tel Aviv, Maale Adumim, Beitar, Ramat Gan, etc) and we dont know what to do! it seems like these kids already know what to do... look at their playground games.. how sad is that? Many theories have been talked about as to what is the cause, the reason we deserve, the incessant rocket attacks. Just like reasons were given for Hurricane Sandy, and for every other tragedy that ever hits a community or the Jewish people, people have been coming up with reasons for the rockets as well, though I must say they have not been given as much press-time as they are given in other tragedies.. This one though is one that I don't think I have heard before, at least not in any direct relationship. Pashkevils out and about are blaming the rockets on the grave disturbing (for the purpose of building housing or hotels or whatnot) around the country, and specifically in the Nesher area. The linkage is defined as the destruction of ancient cemeteries, and the largest one in Eretz Yisrael, done even with "supervision"... removing the bones from their graves in a disgraceful way, so the houses of Jews are destroyed and turned to dust by the rockets. Also in the Likud there is a difference of opinions.. you have both Dan Meridor and you have Rightists. Does that mean they cannot run together in the same joint political party? This interview is in Arabic, but if you click on the caption button at the bottom of the video you can get a [slightly garbled] translation into Hebrew, English or many other languages. Besides for the normal discussion of Israel targeting civilians, Hamas shooting from civilian areas, and the like, Dichter concludes the interview with a story of how someone from Gaza told him, "We don't have an Iron dome system, or Air Raid Sirens, or any deterrence...but we do place our faith in Allah and in the precision of Israeli pilots...."
Much of the protest is, seemingly, based on denigration of Hamas's actual significance. They denigrate the tactics used by Hamas, calling the rockets firecrackers and other similar ways of minimalizing what Hamas is doing. That being the case, Israel is the bad guy because Israel is responding with "real" firepower. Presumably, many or all of these protesters would be ok with Israel if it only used similar firepower in it's response. In other words, they would be ok if Israel would shoot thousands of Kassam-style rockets into the Gazan civilian population. Then they would say Israel's response is proportionate, and all would be good. Presumably. Interesting Psak: The Show Must Go On!